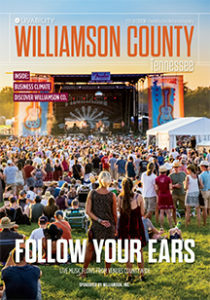 Livability: Williamson County, Tennessee 2017-18 now available | Williamson, Inc.
Williamson, Inc. recently unveiled Livability: Williamson County, Tennessee, the latest edition of a web and magazine marketing program designed to promote the area and draw new business, visitors, talent and investment. Stories promoted online at www.livability.com/williamson-county highlight the community’s excellent quality of life, attractions, live entertainment, restaurants and must-do activities. The latest content features how Williamson County is one of the most pet-friendly places, with special programs geared towards rolling out the welcome mat for pets and pet-owners alike. Discover why Williamson County is rapidly acquiring the nickname, “Music County” with an impressive line-up of great live music and talented artists, and learn how Williamson County businesses are making a global impact. The program also includes a print magazine featuring impactful photography and modern design. Print magazines are available via targeted distribution throughout the community. It is also available in digital format optimized for iPads, tablets and other devices at https://livability.com/tn/franklin/magazine. Livability Media, a subsidiary of Journal Communications, Inc., publishes Livability: Williamson County, Tennessee a print and digital content marketing program that leverages the authority of Livability.com, a national website with information and research-backed rankings on America’s best places to live and visit.